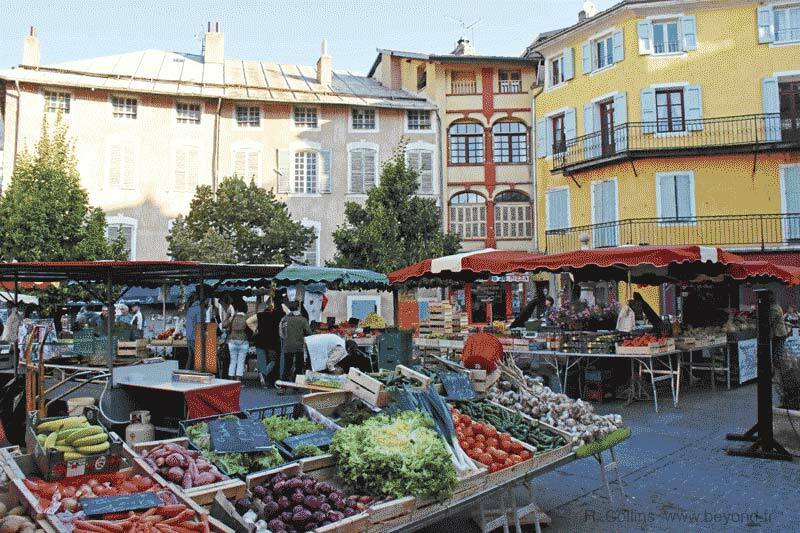 Markets in Provence are generally during the mornings only. Market day is often on Saturday, so even if you don't see it in this list, the village you're heading for might have something on Saturday mornings. NB: Towns and villages do occasionally change their dates, so phone ahead before making a trip just for the market (and please let us know if you find a change). northeast of Lunel, southeast of Gallargues-le-Montueux. Sat (Every) - Brocante, Marché; Place Verdun. Mornings; a big market, one of the best, and our favorite. Sat (Every) - Marché - Morning, through the entire town center, and it takes all morning to see it all; come early to get a parking place. One of the biggest and best. 3 km south of Embrun; 9 km northwest of Les Orres. Daily - Marché, Place du Marche, a couple of blocks above the station. 15 km SE of Nîmes, 12 km southwest of Beaucaire/Tarascon. 25 km NW of Alès; 40 km NW of Orange. 12 km southwest of Digne-les-Bains, 6 km southeast of Chateau-Arnoux Saint Auban, 2 km north of the N85. Village 5 km southwest of Carpentras, 20 km northeast of Avignon. 5 km east of Avignon center. Village, 5 km northwest of Orange. Village 5 km northeast of Avignon center. 10 km east of Nimes; 10 km west of Tarascon; 30 km southwest of Avignon. 20 km south of Aubenas; 15 km north of Barjac; northwest end of Ardeche Gorges. 15 km northwest of Bollène; 15 km north of Bagnols-sur-Cèze; southeast end of Ardeche Gorges. 30 km southeast of Nimes; 30 km northeast of Montpellier. 8 km northeast of Avignon; 4 km southeast of Sorgues. 4 km north of L'Isle-sur-la-Sorgue; 20 km east of Avignon. 12 km east of Orange; 4 km west of Gigondas.